Beef Pot Roast with potatoes and carrots in a silky sauce—it’s an easy, one-pot meal and comfort food at its best! This pot roast recipes works in the oven or on the stove and makes the best pot roast that’s tender and flavorful. 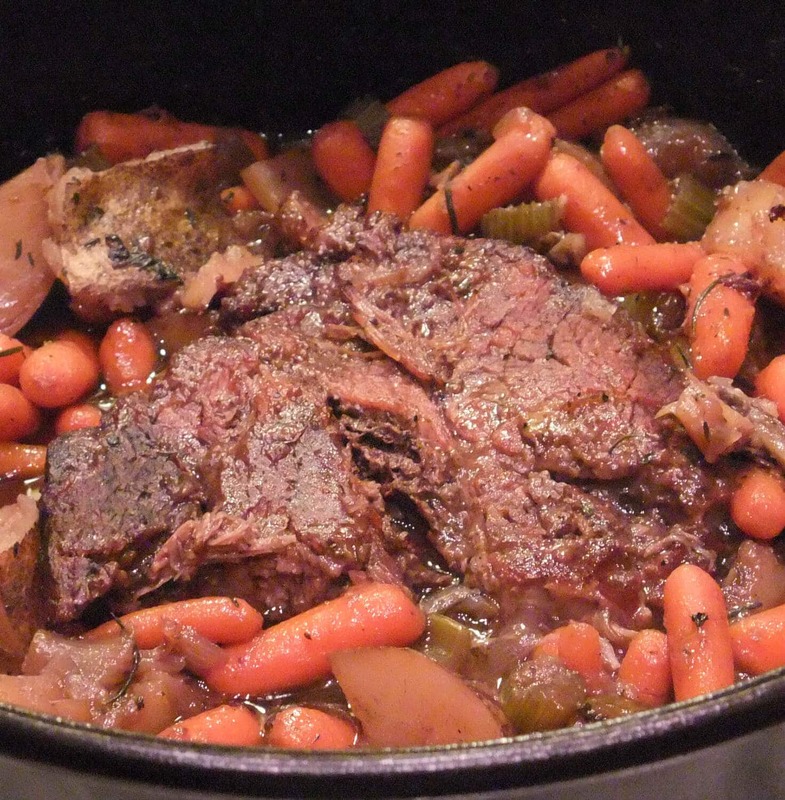 One of the easiest dishes for a new cook to make is slow cooker pot roast. Just take an inexpensive chuck roast, throw it in a crock pot with some potatoes, carrots, onions and celery, add some onion soup mix and cream of mushroom soup and water, and call it good. When you get home from work, voilà—pot roast! I’ve made it that way many times, but these days since I work at home I have a little more time to cook and can cook pot roast the old-fashioned way. The flavors are brighter and richer and I can enjoy the smell of onions and celery and thyme all afternoon. We are not big gravy eaters around here. I love gravy, as long as I didn’t cook it, and my husband loves it too as long as I didn’t cook it. Just not one of my strong suits, which might explain why none of our kids will allow gravy to enter the sanctity of their mouths. When I cook beef pot roast, I use beef broth and red wine, which makes a silky sauce that coats the beef and vegetables without the heaviness of a flour-laden gravy. **Cook’s Tip: Sometimes I chop the vegetables fine and cook the pot roast on the stove and sometimes I cook it in the oven. Either way, the meat breaks down over a few hours into a tender, juicy roast with savory herbs and vegetables. **Cook’s Tip: This recipe also works fine in a crock pot—just brown the roast as indicated and then throw everything into the slow cooker and cook on low for 6-8 hours. Fresh thyme or rosemary – for lots of flavor! **Cook’s Tip: If you prefer, you can omit the potatoes and serve with mashed potatoes instead. Preheat oven to 325°. Salt and pepper the roast and sprinkle one tablespoon flour on each side. **Cook’s Tip: Pat the flour into the meat so it adheres well. Heat 2 tablespoons oil in large roasting pan or Dutch oven on medium-high heat. 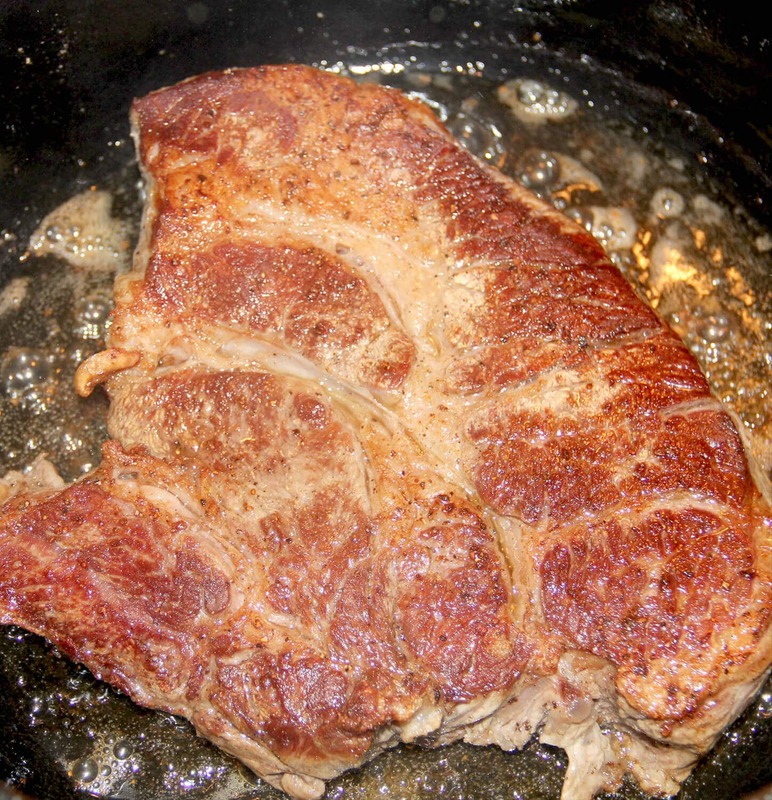 When oil is hot, sear the meat until brown on both sides. This should take about 5 minutes per side. Remove the meat and place on a plate. Add another tablespoon oil to the pot and heat for a few seconds, then add the onions and celery, scraping the bottom of the pot to loosen the delectable bits of meat. Sautè the vegetables for about 2 minutes, until just starting to brown and then remove from heat. Pour in 1 cup wine and 1 cup beef broth, add the dried thyme and put the roast back in the pot. Scoop the vegetables on top of and around the roast, so that the roast is on the bottom of the pot. Salt and pepper the vegetables. **Cook’s Tip: If you have fresh thyme or rosemary you can add a couple of sprigs at this point. Put the lid on the pot, place in the oven, and cook for 2 hours. Add the carrots and potato pieces to the pot, along with more wine and beef broth if the liquid level is getting low. **Cook’s Tip: The liquid should remain a little more than halfway up the roast. And no, my mother never used a bag of baby carrots but I like them and they’re easy so that’s what I use. Cook for 1 ½ more hours or until meat is very tender and pulls apart easily with a fork. Serve with green beans and cornbread, or mashed potatoes if you didn’t add potatoes to the pot. Pot Roast with vegetables in a classic sauce--it's an easy, one-pot meal and comfort food at its best! Salt and pepper the roast and sprinkle one tablespoon flour on each side. Pat the flour into the meat so it adheres well. 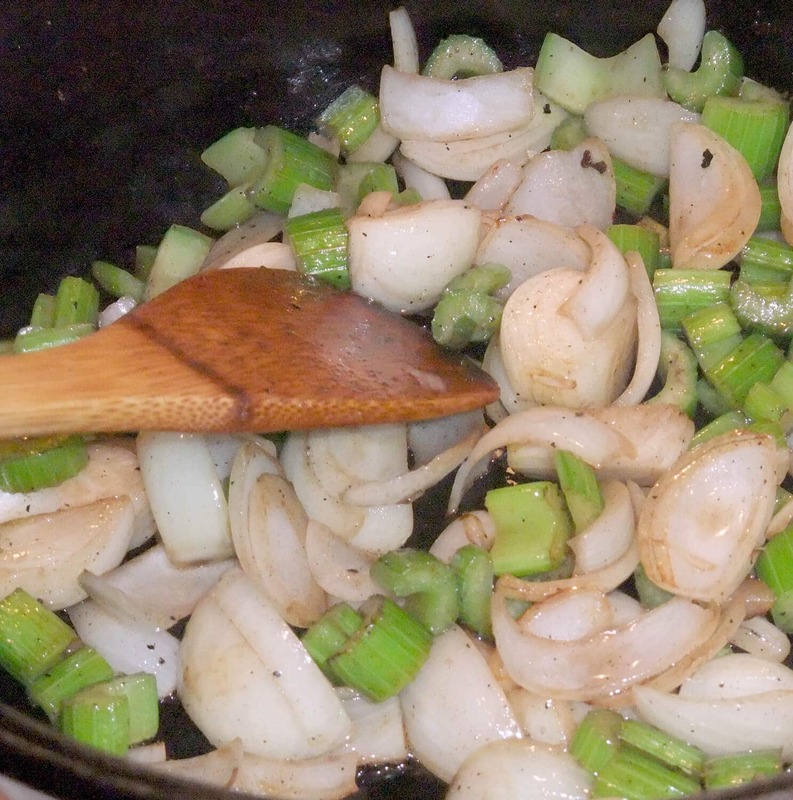 Add another tablespoon oil to the pot and heat for a few seconds, then add the onions and celery, scraping the bottom of the pot to loosen the bits of meat. Saute the vegetables for about 2 minutes, until just starting to brown and then remove from heat. 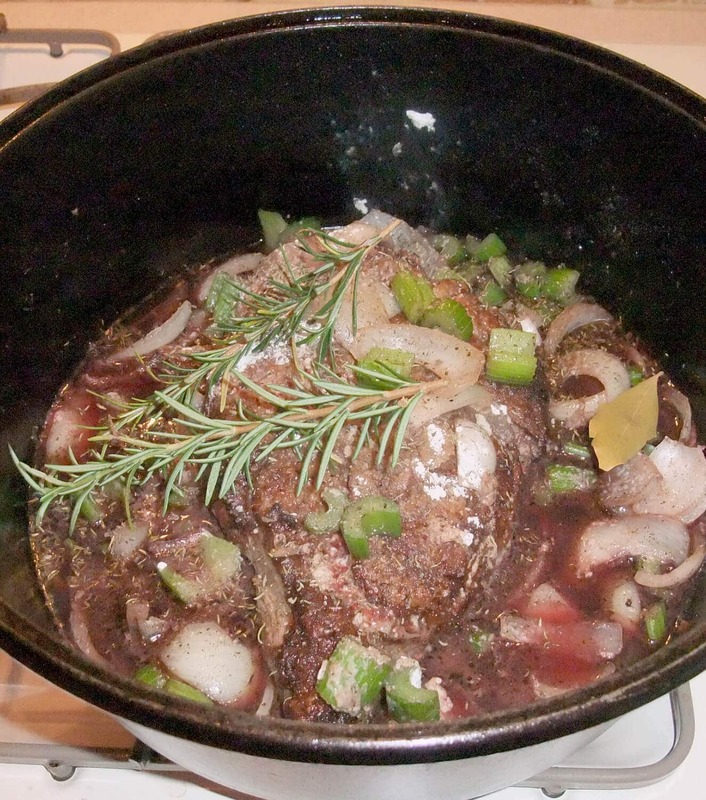 Pour in 1 cup wine and 1 cup beef broth, add the dried thyme and put the roast back in the pot. Scoop the vegetables on top of and around the roast, so that the roast is on the bottom of the pot. Salt and pepper the vegetables. If you have fresh thyme or rosemary you can add a couple of sprigs at this point. Place the lid on the pot, place in the oven and cook for 2 hours. After 2 hours, add the carrots and potato pieces to the pot, along with more wine and beef broth if the liquid level is getting low. The liquid should remain a little more than halfway up the roast. Cook for 1 ½ more hours or until meat is very tender and pulls apart easily with a fork. If you want to serve mashed potatoes instead, just leave the potatoes out of the pot.